What Are the Top 8 Iranian Festivals You Have To Visit ? Iranian festivals, ceremonies and rituals offer great opportunities to get more familiar with Iranian culture. 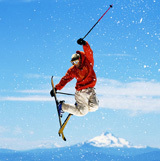 Nowadays, the most interesting factor encouraging everyone to travel is the culture in destinations. So if you are interested in Persian culture, you may like to know more about Iranian festivals. 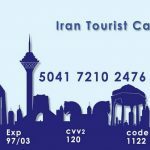 Iran Destination provides you with any information you need to travel to Iran. Read the following article to get all about top festivals in Iran. Yalda night is the longest night of the year, also called winter solstice, and it is celebrated by all Iranians as the victory of light over darkness or good over evil. Every year, on December 21st, Iranians celebrate the arrival of winter; because ancient Iranians believed the dawning of each year was marked by the re-emergence or rebirth of the sun. But what do Iranians do in this festival? 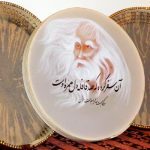 Well, all Iranians gather in their family home; mostly the elderly’s, such as grandparents; and they read Persian heroic poems in Shahnameh and also get guidance from Hafez Poems. There are some special fruits and nuts used during Yalda night. They include mixed nuts and red fruits like watermelon and pomegranates. This red color symbolized the red of dawn. You can read more about Yalda night on our YALDA NIGHT article. The last Wednesday of the year in solar calendar is celebrated by Iranians as Shahr Shanbeh Souri. This festival is rooted in Zoroastrianism and it is sometimes called the Red Wednesday. Iranians gather together outdoors and make a fire, and try to jump over it, reading the song “your red color for me and my yellow color for you”. This is meant that Iranians try to send away their yellow pallor and negative energies and receive the warm energy of the fire. This is one of the amazing Iranian festivals. When the spring begins, Persian New Year is celebrated by Iranians in a festival called Nowrouz. 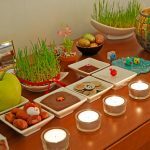 Nowruz means a new day and this festival lasts for 13 days. This is inscribed on UNESCO list of Intangible Cultural Heritage of humanity in 2010. During Nowruz and also before that, the streets are full of excitement, as Iranian people are all out trying to have their holiday shopping and selecting some stuff for their Haft Sin Table. If you walk around in the streets, you will see Haji Firuz as well. Haji Firuz is a jovial character singing and playing tambourine in the streets. He is actually announcing the arrival of the New Year and makes everyone happy. To Read more about Nowruz, Click here. The last day of Nowruz, i.e. the 13th day, is marked as the nature day in Persian culture. This final day is called Sizdah Bedar (Sizdah means 13 in Persian). All the families go outside the house and spend the whole day in nature or parks. They play games, grill kebab and of course have their ever-present tea. The reason they stay out all the day is to avoid bad luck of the 13th day. You can simply join a family and enjoy this day. Don’t worry; Iranians are so hospitable that they won’t reject your request. You can read more about this in our article on Iranian Nature Day. The 9th day of the Islamic Month, Muharram, is called Tasua. This is the anniversary of the 7th – century martyrdom Abulfazl Al-Abbas, one of the Islamic heroes who accompanied Imam Hussain in Karbala. People march down the streets or gather in different mosques all over Iran and hold mourning ceremonies. Also, you can easily find Nazri, or votive food offerings, anywhere in the cities. The best place to see Tasua Festival is Zanjan which has been so famous and popular during the past years. To get when is Tasua in Persian holidays, read our article on Iran Holidays. Ashura is exactly the day after Tasua; i.e. it is held during the 10th day of Muharram. This is the anniversary of the martyrdom of Imam Hussein, Prophet Muhammad’s grandson (PBUH). The performance art of Ta’zieh, which is also inscribed in UNESCO’s Intangible Cultural Heritage list, shows Imam Hussein’s martyrdom in the battle of Karbala which is saddening to Iranian people. Another special ritual during this day is held in the city of Khorram Abad. Peoplein this city engage in the symbolic ceremony of Kharrah Mali (Mud Rubbing), which is designed to show their grief. Ashura is among unique Iranian festivals you’d better see yourself. This is not happening anywhere else, because Islamic countries have their own special way of mourning during this day. So think about this ceremony, if you are interested to know more about Iranian religious beliefs and cultures. You can find when this day falls on Gregorian calendar in our article on Iran Holidays. The most delightful festival to your eyes and nose is the Rose Water Festival in Kashan, Isfahan. Actually, Kashan is mostly known for its historical houses, but the interesting point is that, in this desert city, you can find so many fragrant pink roses specially in Qamsar and Niasar Villages. The best time to engage in this festival is in May to June each year. What happens in this festival is actually extracting the water from the delicate flowers you see around you. This rose water is used in Persian cuisine and also in beauty products. You may already know that the most expensive spice in the world is cultivated in Iran. Yes, Saffron is probably the lightest precious souvenir you’ll buy in Iran. Iranians use saffron in most of their foods. During fall, there is a festival of saffron harvest mostly in north-east cities of Iran. Khorasan province is the most well-known city in Iran cultivating saffron. But in Natanz you can also see this festival. They pick the saffron flower and then pluck the red stigmas and finally they let these stigmas dry. This process is so intensive that makes the spice such precious. Read more about this Persian Red Gold in our article on Persian Saffron. You can explore any of Iranian Festivals through our Iran Package Tours. You can choose which festival to visit and then customize a tour in our Iran Tailor Made Tour. Iran Destination, which is a well-known Iran tour and travel agency, provides you with any Iran travel services you wish to have during your trip to Iran. So before you travel to Iran, first read the articles on our website and then you can contact us regarding any issues in your mind.